A scientific paper has been published about surface characterisation with tandem MS imaging. Using a new method it is now possible to perform unequivocal molecular identification via TOF-SIMS, with the PHI nanoTOF II. The paper is published by Microscopy and Microanalysis, entitled “The Composition of Poly(Ethylene Terephthalate) (PET) Surface Precipitates Determined at High Resolving Power by Tandem Mass Spectrometry Imaging”. It was written by a team from Physical Electronics and Maastricht University. Top row: Mass spectrometry (MS1) total ion and ion-specific images. Bottom row: Tandem mass spectrometry (MS2) total ion and product ion images from fragmentation of the m/z 577 precursor. The MS1 and MS2 images reveal that the [3M+ H]+ precursor (m/z 577) and the corresponding CID product ions emanate predominantly from the surface precipitates. Images are 40 ×40 μm (scale markers 10 μm). Displayed on a linear scale. TIC, total ion current. The paper covers a new method for chemical characterisation of small surface features at high magnification. 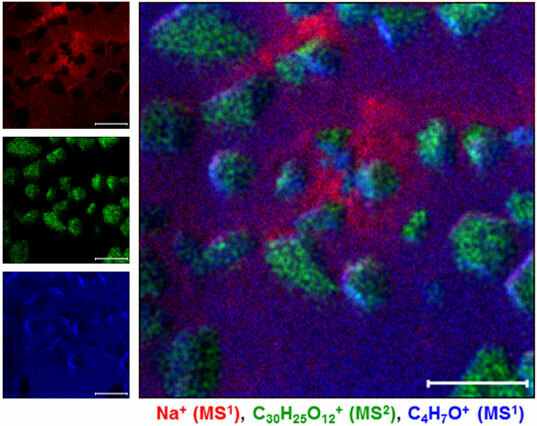 This is the first demonstration of this characterisation technique, with simultaneous collection of mass spectrometry (MS) imaging and tandem MS imaging data. High lateral resolution tandem secondary ion MS imaging was used to determine the composition of surface features on poly(ethylene terephthalate) (PET) that precipitate during heat treatment. The surface features, probed at a lateral resolving power of <200 nm using a surface-sensitive ion beam, were found to consist of ethylene terephthalate trimer at a greater abundance than the surrounding polymer matrix. This is the first time that PET surface precipitates have been chemically identified without using extraction or reference material. The new method used in this research also represents the highest practical lateral resolution ever reported in tandem MS imaging. False color overlay image (right) of Na+ (red), [3M +H]+ (green) and C3H7O+ (blue). 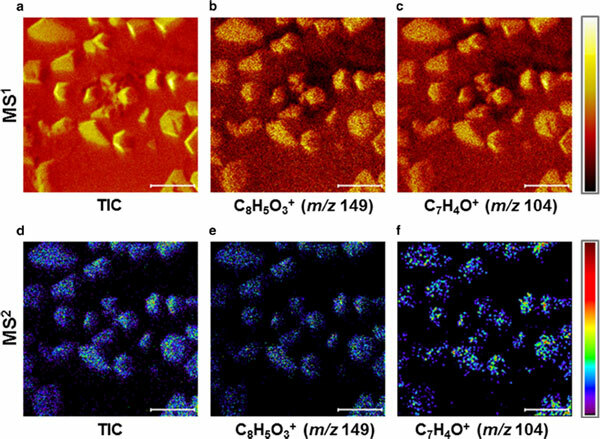 Individual ion images on left. The mass spectrometry (MS1) and tandem mass spectrometry (MS2) data were collected simultaneously. 40 × 40 μm (scale marker 10 μm). The instrument used in this study is the PHI nanoTOF II, a powerful tandem MS imaging spectrometer. The high speed of the TOF–TOF spectrometer screens matrix components with MS1 imaging, together with targeted via MS2 imaging in just a few minutes. 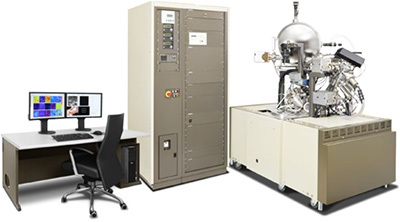 The system is ideal for “precious” or one-of-a-kind materials, because many tandem MS imaging analyses can be performed on one sample, using highly sensitive MS1 and MS2 pulse counting detectors. Where TOF-SIMS could previously only provide an educated guess, it is now possible to perform unequivocal molecular identification. The paper is written by Gregory L. Fisher, John S. Hammond, Scott R. Bryan and Paul E. Larson of Physical Electronics, together with Ron M. A. Heeren of Maastricht Multi-Modal Molecular Imaging (M4I) Institute at Maastricht University in The Netherlands.